Hey! 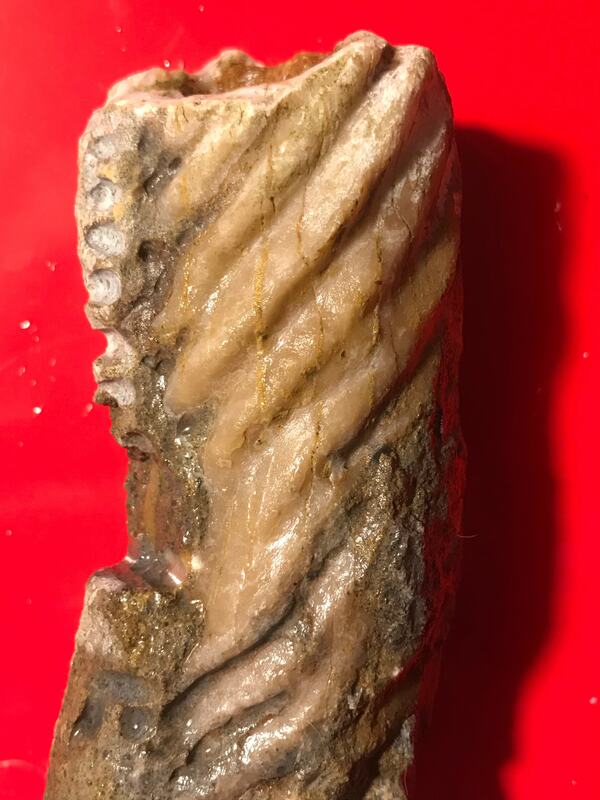 I was looking for native artifacts in a neighbourhood creek when I came across what I thought was a somewhat large cephalopod fossil. The creek is in Louisville Kentucky, leading to Floyd’s Fork. From the USGS Mapview, it looks like it’s Ordovician of the Drake’s formation. Either Bardstown member or Saluda Dolomite member. Upon further examination, I saw that the ridges on the sides were angled very steeply. It was very covered by matrix, so I decided to get to work on it with a dremel tool. 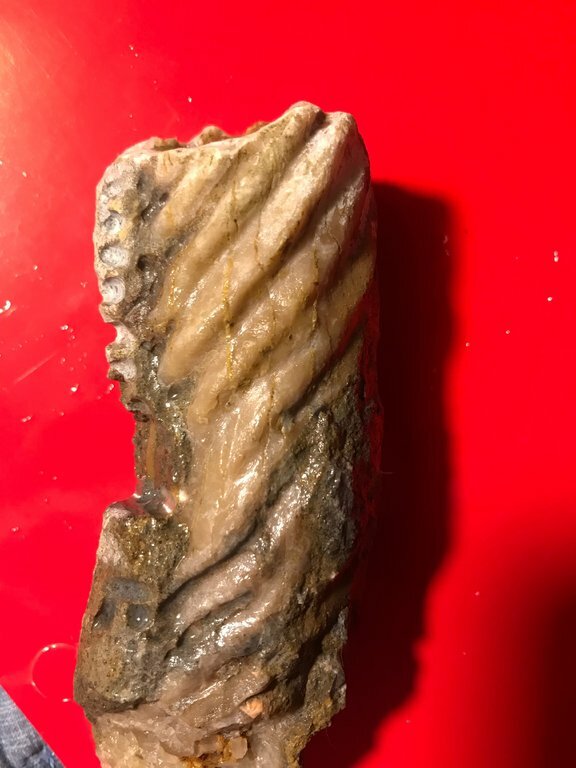 After getting a significant amount of material off the fossil, I found that the ridges along the side were not in fact bilaterally symmetrical, and rather that these ridges went down the length of it, spiraling like they would on a screw. It is hollow, partially filled in with some softer, red stone and crystallized on the inside. From what I can tell, it has a curve to it reminding me of cyrtoconic(?) cephalopods. I read somewhere that cephalopods are bilaterally symmetrical, so I decided to post this here since I now don’t have any better guesses on what it is. 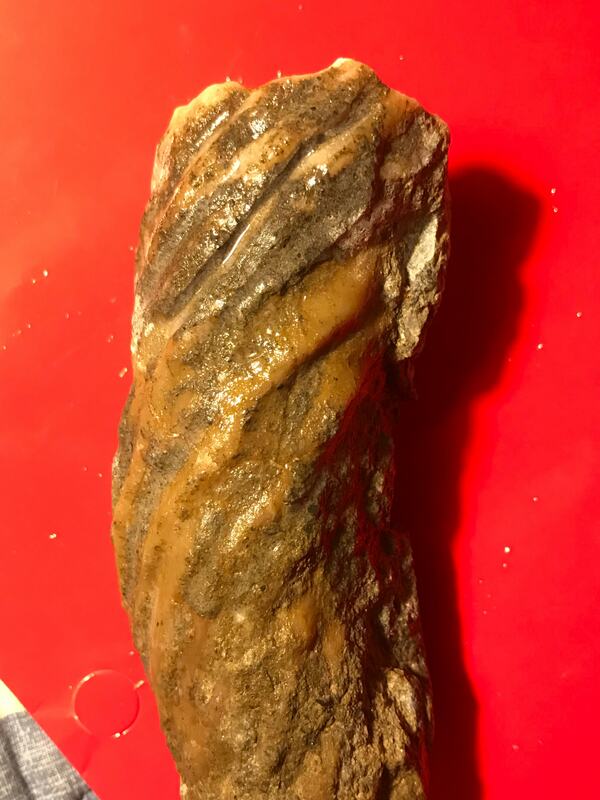 My only other thoughts are that shark coprolites can be spiral shaped, and that it seems too smooth and hollowed to be a horn coral. My heads buzzing about this. Mum said it could be a unicorn horn . Due to upload limits, I will be adding a couple more photos below. 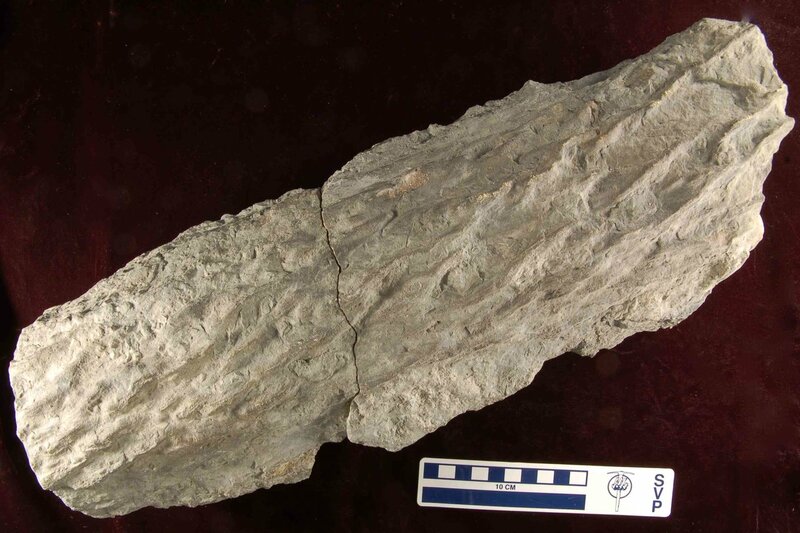 I could not find any other fragments of the fossil besides this one section. Please pardon my prep work and note that it isn't done yet. I had to run inside while working due to severe rainfall. In the bottom two images, those indents on the upper-left side are from my dremel tool while etching away arduously.  Thank you for the input! Let me know if you need to see an image from a different angle or something. What a strange object, at least for me! Thanks for sharing. I have no idea what it is, but I hope, I am learning something new today, too. And you did a really good job describing, preping and photographing this object. Congrats! got a man-made vibe to it. It does look like a churro! I do t think they had those back then. I know nothing about the Ordovician. We don’t have any near where I live. I wonder if it could be something like a coral. I’d say a burrow, but I can’t say that I’ve ever seen a crystalline filled burrow. The burrows we have here are all casts, the infill of the burrow. Is there a taper in diameter from one end to the other? Very cool looking and the crystals inside are quite pretty. @Herbis from Kentucky. Maybe he will have some thoughts. Now that is really interesting. It appears that it could be the crystallized (I'm assuming calcite) infill of something or other. But the question still remains for me: what? I’m assuming calcite as well based off the white color but I still don’t know my minerals. I’m quite sure that it’s not, completely at least, man-made. It does seem to taper in diameter, increasing towards the end that is most open (with the picture). The other end is more crystal-filled, broken up, and stone-covered. I may be able to clean it up completely tomorrow to get better pictures in. 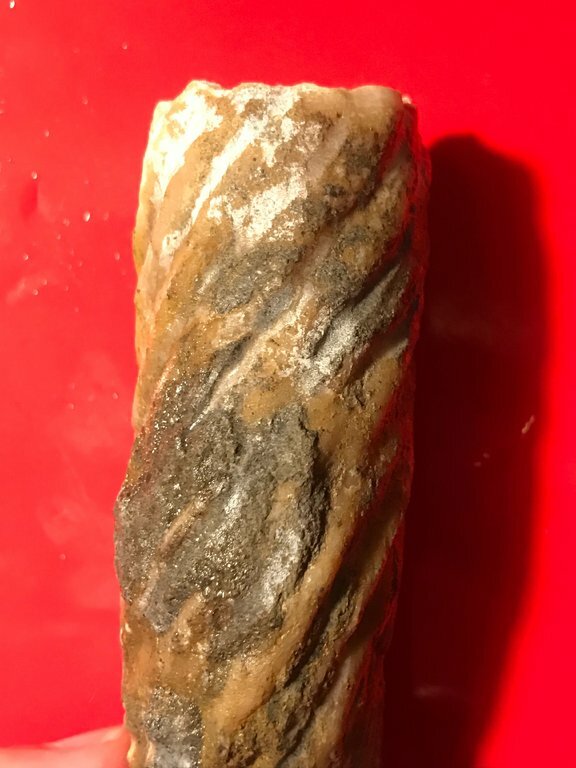 Fascinating specimen and I'm pretty stumped - the only spirally ridged fossils I can think of are sponges which is a very tentative stab (presumably heavily recrystallised if so). This is Helicodictya, but it's Devonian. Ok, thats the bedrock geolgoy. How did you find the specimen? 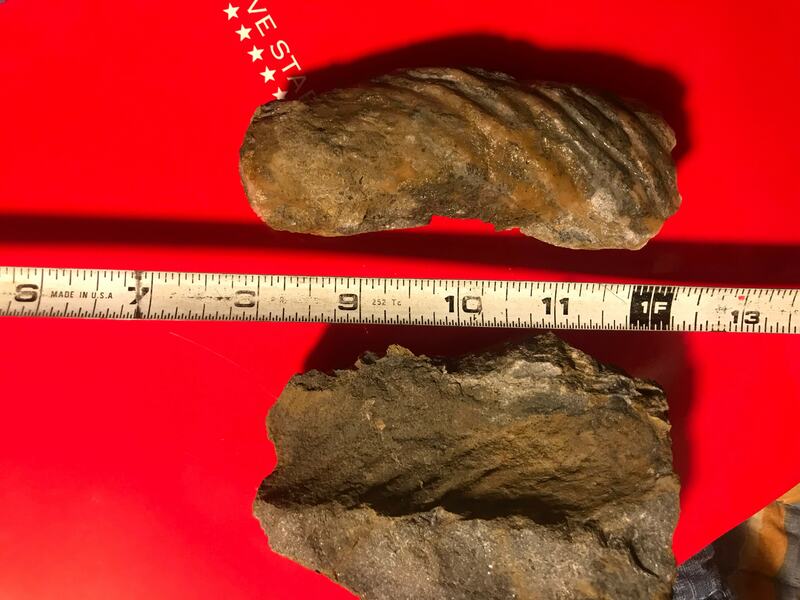 Was it a loose "rock" in the creek? Sure these look like calcite crystals. Put a grain in vinegar and see, it it fizzes. It does seem to taper in diameter, increasing towards the end that is most open (with the picture). The other end is more crystal-filled, broken up, and stone-covered. Theres no cable material in there but maybe it was originally vertical-standing and it was a small bore hole? Like someone could’ve drilled into the stone, and then it could have filled in with crystal and sediment? - piece of a cable gets encased in concrete/mortar. - cable rusts/weathers away or/and is pulled out of its mold. 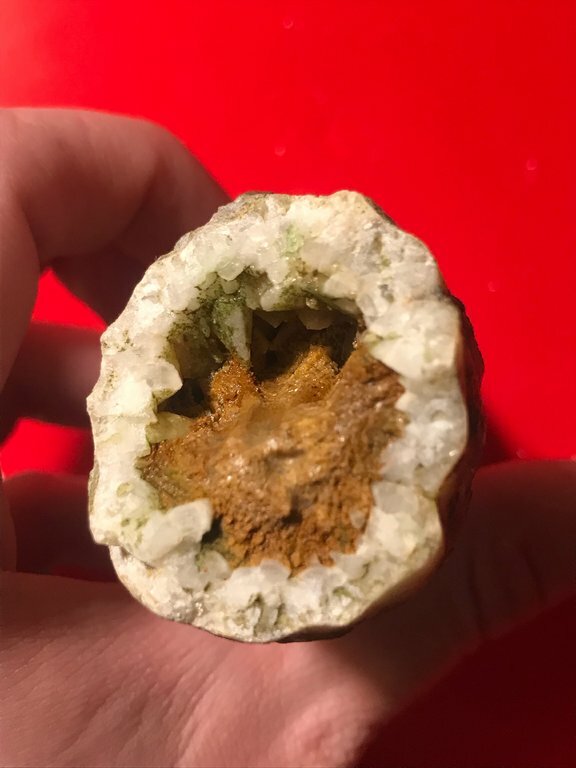 - mold gets partly filled with calcite crystals. - @mar2man22 comes along and extracts the cast/steinkern of the cable. Oh, the sponge/stromatoporid hypothesis sounds much better! I just tried and yes it did fizz under vinegar. It was at first a loose bit of limestone, and the mold shown in that picture is from when at some point I used a hammer and chisel to break that piece off. Luckily I haven’t yet snapped the thing in half haha. Perhaps I’ll go back there and see if I can find more of these. Unless anyone’s got better ideas, I’m going with it being an Aulacera sponge/stromatoporoid. heres the best example of A. Undulata I could find. That looks a very good bet. This may be a nice example of Aulacera plummeri (picture below ). 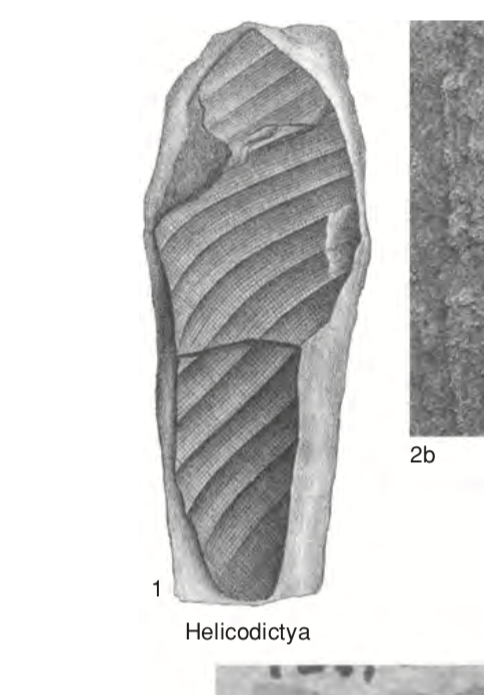 Beside the similar shape of the cross section, it has the spiraling character of the outer surface of your specimen (but not so exaggerated) with more or less rows. Yep, A good SWAG would be the stromatoporoid genus Aulacera. Especially based on the formations (upper-most Richmond) you found it in. And with the crystallized interior it makes for a pretty dang cool specimen.